Take pause and marvel at the beauty of New York City’s splendor aboard a Bateaux holiday cruise. Enjoy full-circle views of the iconic skyline as it dazzles across New York Harbor in December. Bateaux’s exquisite glass-enclosed deck brings warm moments of the season to life. 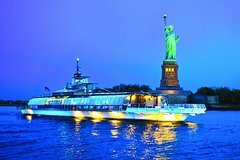 Step aboard the all-glass, European-inspired Bateaux New York for an unforgettable evening. Departing from Chelsea Piers, you’ll enjoy a leisurely 3-hour cruise along the Hudson River featuring upscale cuisine, live band entertainment, and unobstructed views of the Empire State Building, Brooklyn Bridge, Statue of Liberty, and more.